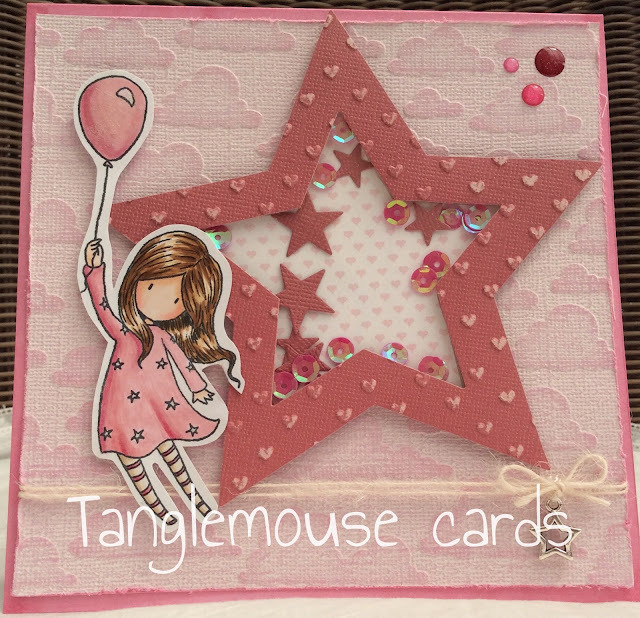 Today's DT card is made with the lovely Sugar Nellie Suzanne Woolcott Gorjuss girl, 'up, up and away'. There's a few firsts here for me; this is the first Gorjuss I have coloured and the first shaker card I have made. (Quite straightforward! I found a tutorial on good old Pinterest) and also (eeeeek) first fussy cutting! 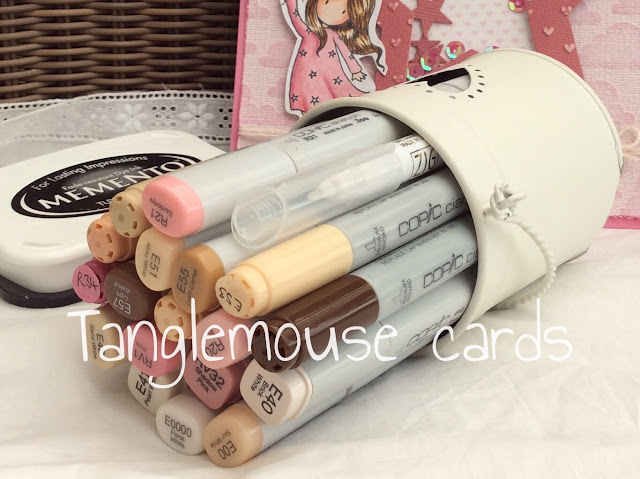 I coloured this lovely image with Copics and used Core d'inations cardstock, embossed and distressed to make the background and the frame of the shaker card. Finally I added a heart shaped charm and some twine from The Ribbon Girl. Here we are then, gorgeous Gorjuss proving there's a first time for everything! Hi Sue...... well your three 'firsts' went soooooooo very well! I'm loving this Gorjuss Girlie.. and wow to the wonderful shaker star!!! Not to mention your fussy cutting..... I'm a bit of an addict as you know! And all the above go so well together on your fabulous card... I like that you used the clouds embossing folder in the background - just right for the design! I hope you gather from all this that I LOVE this card! Aww so cute I love that stamp!! Fab colouring and gorgeous design! A gorgeous starry starry card Sue. Love the image and pretty pink shades. Beautiful card Sue, your Gorjuss girl looks great floating in front of the shaker. I'm so impressed you did a star shape for your first shaker. I struggle to make cards without all my layers of DP and I just realised there's almost no DP on here, just the gorgeous embossing, which adds such a lovely texture.